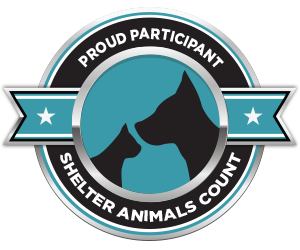 Animal Welfare Friends is teaming up with the Monticello Veterinary Clinic on July 8th to bring you low cost microchipping & vaccinations at our shelter! We’ll be offering cat & dog rabies or distemper vaccinations for $10 each between 1pm and 2pm, and cat & dog microchipping for $20 each between noon and 3pm. No appointments are needed, so stop out and make sure your pet is healthy and safe! Vaccinations are critical protections for you pet, whether they’re indoor or outdoor. And microchipping is the easiest way for your pet to get back to you if they ever get lost! We have our very own poster fur-child for microchipping your pets — our shelter cat, Tommy! Tommy became lost in 2013 when our Cat Adoption Center in Anamosa caught fire. He was the only cat we weren’t able to find after the fire, and after three years missing we’d nearly given up hope. Until the fall of 2016, when a stray cat was picked up by Cedar Rapids Animal Care. 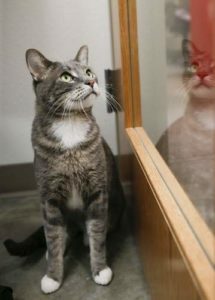 They scanned him for a microchip, and it came back as registered to the old Anamosa Cat Adoption Center. Shortly after, we were reunited with Tommy, and he was brought to live at the new shelter as our kitty mascot! We don’t know where Tommy spent his three years away from AWF, but we DO know that it was his microchip that brought him back to us!! Protect your own pet by microchipping and vaccinating them today!